In 1850 German immigrants were settling in two distinct areas of Manhattan--the crowded Lower East Side and the developing Yorkville neighborhood to the north. Slightly to the south of Yorkville was the estate of Adam Tredwell (sometimes spelled Treadwell). Tredwell died in 1852 and his "farm" was soon divided into lots. An 1868 agreement among property owners set standards for construction and disallowed undesirable businesses (like slaughterhouses and breweries). The area also attracted German-speaking citizens; but these were not the working class settlers filling jobs in Yorkville's cigar factories and such. The Presbytery of New York recognized the need for a new church to serve the growing population. In 1886 construction started on the modest brick and stone Church of the Redeemer. The Presbytery had commissioned architect Samuel A. Warner, who had just completed work on its tiny Victorian Gothic mission house at No. 420 West 57th Street. The Church of the Redeemer would share many of its architectural elements, on a larger scale. Completed at a cost of $20,000--about $521,000 today--the 50-foot wide structure was designed with rigid symmetry. The central portion projected slightly and rose to a peaked gable a story higher than the flanking sections. The simple but handsome entrance portico was supported by buttresses; its sharply angled gable pierced with an eye-catching oriel. An especially attractive rose window dominated the upper section. The German-language congregation worshiped here until the turn of the century. Typical of Presbyterian groups at the time, the Church of the Redeemer was active in outreach to the poor. As late as 1900 The New York Charities Directory noted its "mission and relief work, among tenement houses." But by the time of that listing the Church of the Redeemer was leasing the main building to another German congregation, the Bethlehem Lutheran Church. Finally, on May 22, 1901 The New York Times reported "The Presbytery of New York has sold the church property 241 East Sixty-second Street to the present tenants, the Lutheran Church Society." Bethlehem Lutheran Church quickly turned the building over to the Evangelical Lutheran Church of St. Matthew. But they, too, would not stay long. In the years just prior to the outbreak of World War I the neighborhood saw a new wave of immigrants, the Hungarians. 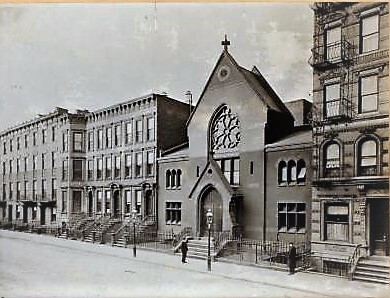 In February 1913 the Church of St. Matthew sold the building to the Home of Christian Hungarian Sick Benevolent Society. The Real Estate Record & Builders' Guide noted "The buyer will remodel the present building and use it for its own purposes." Those purposes were a bit more secular. The church was remodeled into was described as a "meeting room." The activities here were now starkly different. On January 14, 1914, for instance, The Times reported "The Hungarian-American A. C. will hold its second annual wrestling tournament on Jan 23 and 24 at the clubhouse, 239 East Sixty-second Street." Immigrant communities formed sports groups aimed to keep boys off the streets and out of pool rooms and saloons. The Times noted "Among the clubs entered are the Boys' Club, Bronx Church House, Scandinavian-American Athletic League, Greek-America, German-American, and several branches of the W M. C. A." Later that year, in April, the Christian Hungarian Society hired architect I. Leitersdorfer to fire-proof the "one-story brick meeting room." The cost of the project was $400, nearly $10,000 by today's standards. But like its predecessors, the Hungarians would soon leave. On January 23, 1919 the New-York Tribune announced that the Christian Hungarian Sick Benevolent Societies of New York had sold the property to Philip Leone for $40,000; only slightly more in relative terms than the original construction cost. Just a year earlier the Rev. Philip Leone had founded the Roman Catholic Church of Our Lady of Peace. Born in Italy, he was ordained there in 1903 and came to the United States shortly afterward. Interestingly, he founded the Church of Our Lady of Peace before becoming officially affiliated with the Archdiocese of New York in 1919, according to The New York Times later. Rev. Leone also organized the first branch of the Italian Holy Name Society and the first Italian chapter of the Catholic Daughters of America. Now that his Italian-speaking congregation had a building, it immediately laid plans to restore the sanctuary to a house of worship. Architect Thomas J. Duff completed plans "for alterations and extensions" late in 1920. Construction, costing $30,000, began early in 1921. The result was a jewel-box interior of white plastered walls decorated with delicate gold stenciling and frescoes. Rev. Leone served as pastor of the Italian congregation until his death in 1945. 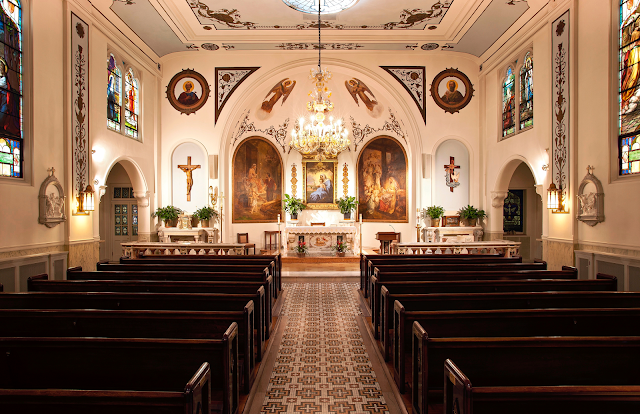 The Church of Our Lady of Peace continued to serve its parishioners as generations were baptized, married and their funerals held in the familiar sanctuary. Then, on July 31, 2015 ABC News reported "A nearly century old Catholic church on the Upper East Side held its final mass Friday afternoon." Congregants had been caught off guard by the New York Archdiocese's decision to close 112 churches in a cost-cutting consolidation. Even as Father Bartholomew Daly offered Communion for the last time, parishioners were hopeful. An appeal had already been sent directly to the Vatican, pleading for papal intervention. Five volumes of documents outlined the congregation's history, its mission and its importance to the community. The church was locked and the congregation officially merged with St. John the Evangelist on East 55th Street. But many recalcitrant parishioners refused to give up the fight. Mass was held outside Our Lady of Peace and every day for two years they gathered on the steps, despite rain or snow, to light candles and pray. Petitions, letters, and fundraisers sought to pressure Catholic officials to reopen their church. A group called the Friends of Our Lady of Peace hired attorneys and appealed the closing. Finally, two years after sending their appeal to the Vatican, the congregation got a response. Despite gathering 4,000 signatures of support and $500,000 to prove that the church was financially self-sufficient, the Vatican's Congregation of the Clergy ruled in favor of the New York Archdiocese. In January 2017 representatives of the congregation announce plans to appeal. But it was all too late. Cardinal Timothy M. Dolan had been working on his own plans. Under his direction the Archdiocese leased the building to the Coptic Orthodox Church, an ancient Egyptian-based Christian denomination. The New York Times reported on March 5, "The lease is the first stage of a plan to transform the church into the Coptic Church's New York cathedral, an idea that both Cardinal Dolan and Coptic leaders say Pope Francis has blessed." And so the little brick church, having served German Presbyterians, German Lutherans, Hungarian Christians, and Italian Catholics, enters its newest chapter. In the meantime, other than a paint job, little has changed outwardly to the Samuel A. Warner's charming structure.